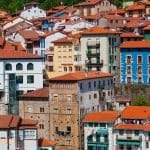 An autonomous community in northern Spain, País Vasco stretches 100 miles from Bilbao to Bayonne, France, and offers a different history, culture, and cuisine than the rest of Spain. Upon your arrival in Bilbao this morning, you will be met at the airport and transferred to your hotel. If it is too early to check in, leave your bags at the hotel and head straight to the famous Guggenheim Museum. Opened in 1997, and designed by Frank Gehry, the museum is an example of 21st century architecture, created with unusual materials and unique forms; it resembles a silver fish and connects the city with its river. Break for lunch at the museum’s outdoor café. Later this afternoon, visit the Museo de Bellas Artes, one of Spain’s important museums of painting and sculpture. The cultural and economic capital of País Vasco, Bilbao is a city with a grim industrial past that is currently undergoing a social, economic, and aesthetic revitalization process. You’ll have the remainder of the day in which to explore the city on foot. Surrounded by lush green hillsides, the city boasts beautiful old buildings and stunning new structures. 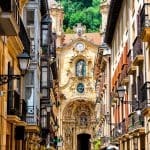 Bilbao is roughly divided into two regions: the Old Quarter, with local shops and tapas bars concentrated around the public square of Plaza Nueva, and the New Town. This evening, feast on a fabulous dinner of traditional Basque seafood. After breakfast this morning, collect your rental car and set out along the coast to begin exploring Basque country. Your first stop is Bakio, a small town famed for its stunning beaches and steep cliffs. Outside Bakio, you’ll visit a small island connected to the mainland by a man-made bridge. For lunch this afternoon we recommend a Basque farmhouse which dates back to the early 19th century, and serves fresh fish, vegetables, and wine from surrounding farms and vineyards, while offering stunning views of the island. After lunch, you’ll hike up the 231 steps to the 1,000-year-old monastery which is situated at the top of the island. Historically, sailors made the upward trek to give thanks for surviving shipwrecks, and today, fishermen visit the site to pray for a good season. Continue on to the historic fishing village of Lekeitio, which is isolated from the hustle by its location down a long, winding road. Here, you’ll spend the night in a beautiful 17th century palace that was recently transformed into a hotel. Our dinner recommdation this evening is a portside restaurant, which serves fabulous and fresh seafood. After breakfast, you’ll have the morning to explore Lekeitio on your own. Walk along Isuntza Beach or through the old quarter of town, which is reminiscent of an old fishing village. If you’re feeling ambitious, climb nearby Lumentza Mountain. As lunchtime approaches, drive one hour to the seaside town of Getaria, where you’ll meet your guide for a visit to a family run winery. The green hills around the beachfront villages of Getaria and Zarautz are covered with the noble grape varieties of Hondarrabi Zuri and Hondarrabi Beltza, the grapes in regional favorite, Txakoli. Enjoy a guided tour through the cellar, given in English by one of the family members of the vineyard. Afterwards, you will have a full tasting of the Txakoli paired with local seafood of anchovies and tuna. Continuing on to San Sebastian this afternoon, you’ll check into your charming hotel, located on the city’s bay. 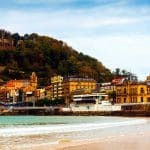 Overlooking the beautiful bay of La Concha, San Sebastian is an elegant city with fabulous beaches and surrounding peaks. This evening, you’ll meet your San Sebastian food and wine guide for a food and wine tasting tour through the old town of San Sebastian. Your evening includes several stops, where you will enjoy pintxos, some of the world’s finest miniature cuisine, paired with a taste of accompanying local wines. This morning, you will be transferred to a picture-perfect village at the water’s edge, for your Basque cooking class with an internationally renowned local chef. The visit includes a gourmet lunch that you’ll help create. Enjoy your handiwork, paired with local wines, on the restaurant’s terrace overlooking moored fishing boats in the harbor. Return to your hotel after lunch. Relax, or explore the city on your own for the remainder of the afternoon. Later, meet your guide for a very special visit to one of Spain’s finest wine cellars. This is a unique chance to see one of the most exceptional collections of wine in the world guided by a talented and inspiring sommelier. Afterwards, you are invited to have dinner (Optional) or return to San Sebastian.ing international recognition. Wine lovers will be excited to sample this fresh, slightly fizzy wine, which perfectly complements the region’s local seafood. Today, you will drive back to Bilbao on your own. You may wish to continue on to Basque France, following our itinerary from the city of Bayonne. If this is the end of your journey you will return your car at the airport in time for your flight home. As lunchtime approaches, drive one hour to the seaside town of Getaria, where you’ll meet your guide for a visit a family run winery. The green hills around the beachfront villages of Getaria and Zarautz are covered with the noble grape varieties of Hondarrabi Zuri and Hondarrabi Beltza, the grape varieties in regional favorite, Txakoli.